Storyline: In a confusing society divided by factions (Abnegation-selfless, Amity-peaceful, Candor-honest, Dauntless-brave, and Erudite-intelligent) Tris finds out that she's Divergent. She can't fit in any of the categories and she must find out why Divergents are considered dangerous. Exciting adventure movie; stellar performance from actress Shailene Woodley. Some would say that this was a disappointing movie adaptation of the book " Divergent" written by Veronica Wroth, with too many omissions and edits. 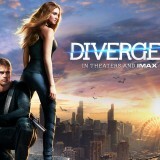 Set in a contemporary Chicago, Divergent has it all – action, brilliant characters, twists & turns, love story, and more. In the new movie, Divergent, the central character is Tris, played brilliantly by Shailene Woodley. The film is set in a bleak future, centered in a city of ruined concrete structures that is what remains of Chicago. The city has five walled factions. Abnegation is a faction about self-sacrifice and purity, and they wear plain tan outfits. The Erudite faction are focused on knowledge, while Candor are always impeccably honest, and Amity are naturally peaceful. The final faction is Dauntless, and these are the fearless warriors dressed in black. Tris (also called Beatrice) was raised in the Abnegation faction, but she and other young people have a right to make their own selection of what faction they want. There is a test which is used to let people know which faction is best suited for them. This test is where Beatrice/Tris discovers she is part of a rare forbidden category called Divergent. As a Divergent, she has the primary qualities of three different factions: Erudite, Dauntless, and Abnegation. While her character traits of intelligence, courage and self-sacrifice sound like a positive combination, this is forbidden because it means she has independent thought. Tris decides to choose Dauntless as her faction, because of her action-oriented nature, though she has no particular athletic prowess at the beginning of the film. Woodley’s portrayal gives us a compelling representation of this young woman who forces herself to do difficult and dangerous tasks, even though she may be quaking on the inside as she does. The first half of the movie Divergent has Tris going through basic training to become a Dauntless. In thrilling scenes, she learns to fight with bare knuckles, throw knives like a master, and leap and kick with the best of them. She has to face challenges like jumping aboard a speeding train, and the audience can feel both her fear and her courage. In the second half of the film, Tris has to put her skills to use in battling against corrupt leaders. The combat scenes keep coming, and the heroine shines in her role, in a way that is reminiscent of the Hunger Games. The film keeps you invested in her progress and challenges. Theo James plays Four, the drill sergeant, and he manages to be both a heart throb and a rock-hard task master at the same time. Kate Winslet plays an icy intellectual who leads the Erudite faction, and does a masterful job of making her case for why society needs to be tightly controlled. Woodley makes the film, however, with her ability to give us a powerful, individualistic heroine, who is also a vulnerable young woman. Find the most competitive price for Divergent in the table below. If viewing from a mobile device please click on + to get more information.